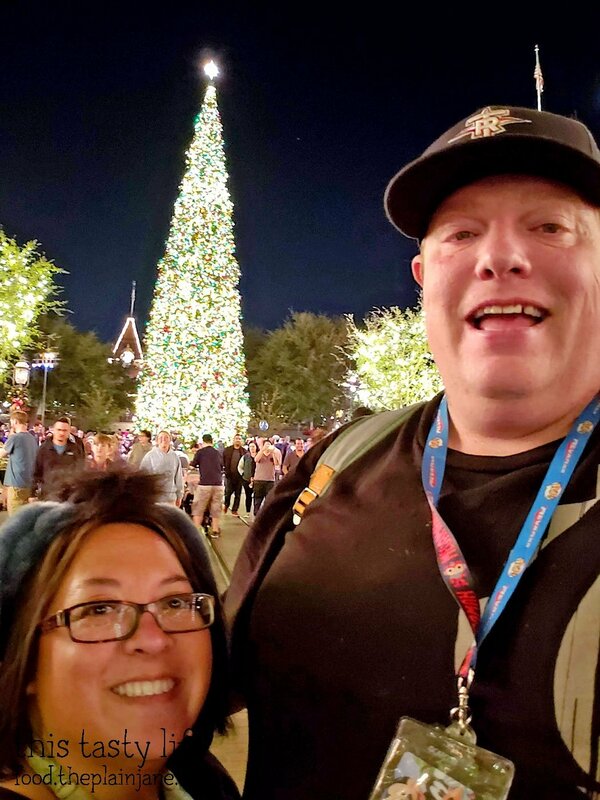 Jake and I got annual passes for Disneyland on a Wednesday last year in November, so it seemed appropriate that our last day as annual passholders was on another Wednesday in November. We decided to skip a year with Star Wars Land opening next summer to let some of the hype die down. And with more blocked out days for our current passes anyway, we felt it was the best decision so we could spend time traveling to other places. 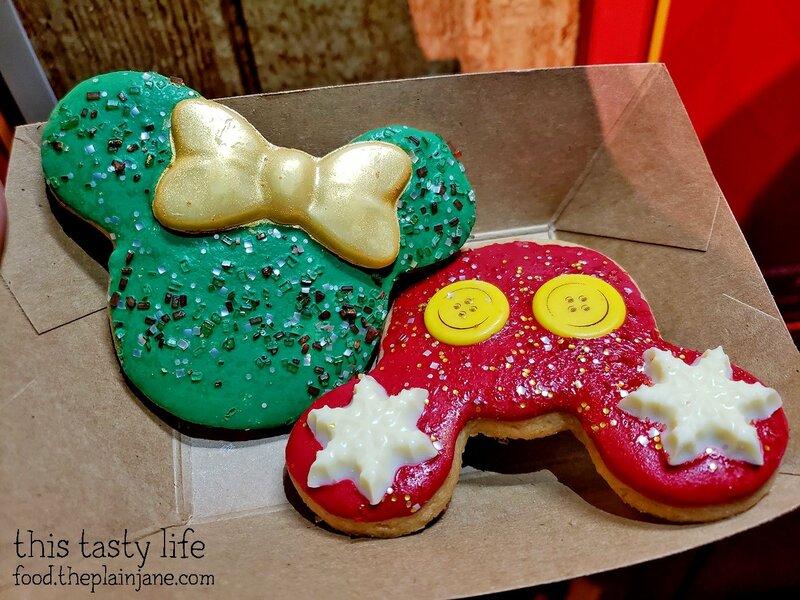 The Festival of Holidays is now going on and we attended specifically to try out the holiday foods at the booths in Disney California Adventure. 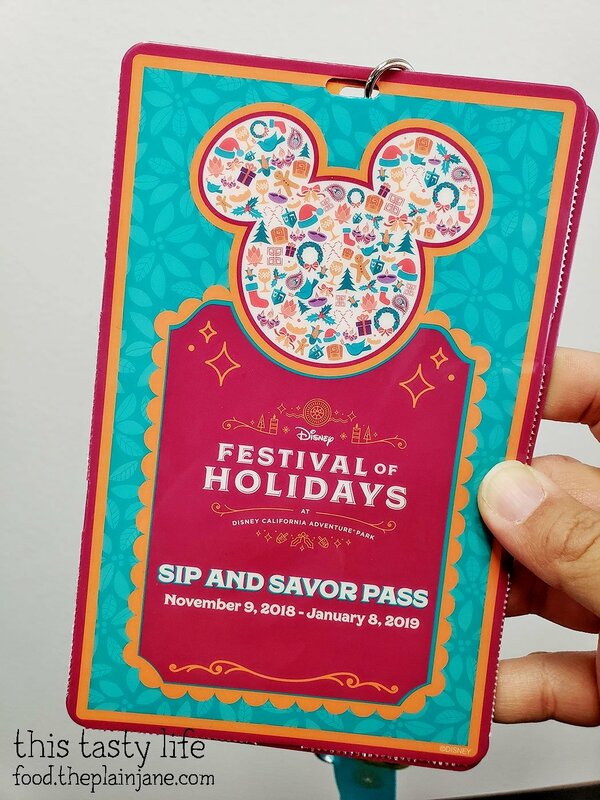 We purchased the Sip & Savor Pass for the Festival of Holidays. As an AP (annual passholder), you get a discount on the pass. For AP it is $49, or $54 for non-AP. You get eight “coupons” (which were tabs on the side of the pass) which are good for food and featured beverages at the booths in California Adventure. They are not good for alcoholic beverages. The pass is good until January 8th, 2019, so you don’t have to use them all in one go if you plan to return to the park. 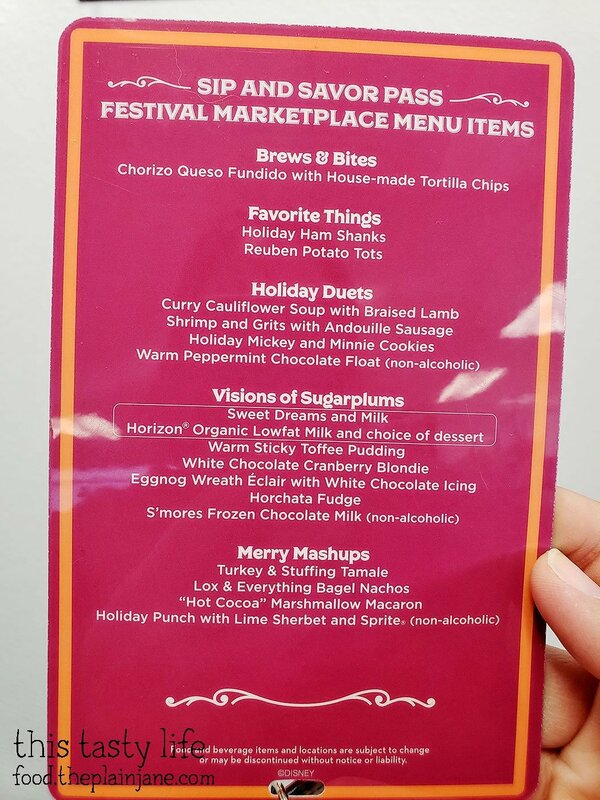 The handy dandy pass comes with a menu listing all of the items available for the Festival of Holidays marketplace. It comes on a cute lanyard. AP get a little button for each booth they visit. I visited 8 of the 11 booths. We also stopped by AP Corner to get a photo taken and to make a card to send to someone in the military for the holidays. 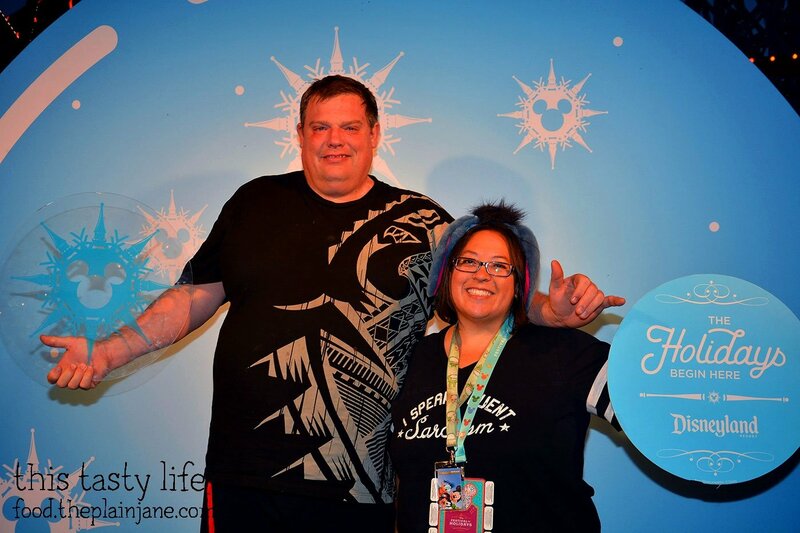 Jake and I shared all of the items for Festival of Holidays and took a few home so we wouldn’t get too full. 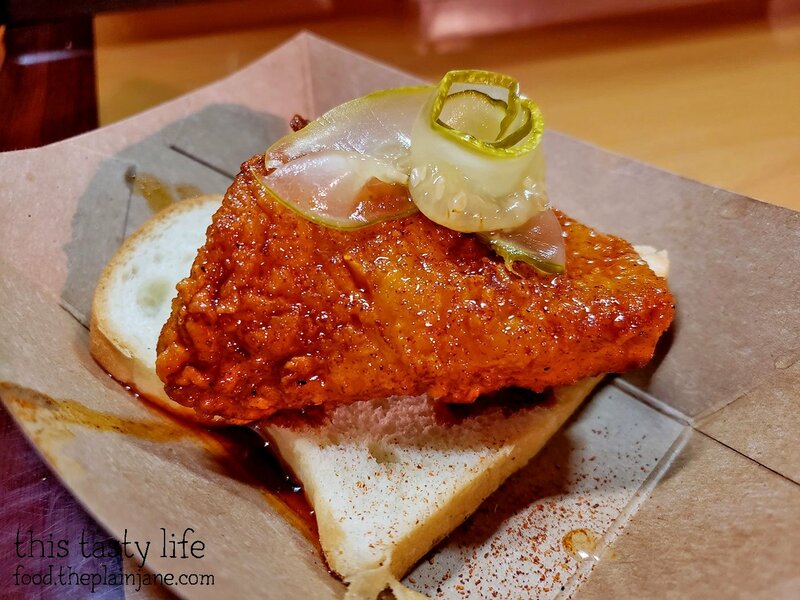 Our first stop was at the Spicy Celebrations booth for the Nashville Hot Fried Turkey with Dill Pickles [$7.50 a la carte]. It’s boneless and it was kind of like a spicy boneless chicken wing. It had a nice glaze on it that made it kind of glisten and sparkle and I liked how the pickle looked like a rosette. The white bread is necessary, in my opinion, to mellow out the spice a little. I only had one bite and the spice kind of lingered in my mouth for a few minutes. Jake said it started to get after it lingered in his mouth after he ate the rest (too spicy for me). I thought the exterior would be crispier than it was. Mostly this was just spicy to be spicy without a ton of added flavor. Next item up is from Merry Mashups with a Turkey and Stuffing Tamale [$7.75 a la carte]. 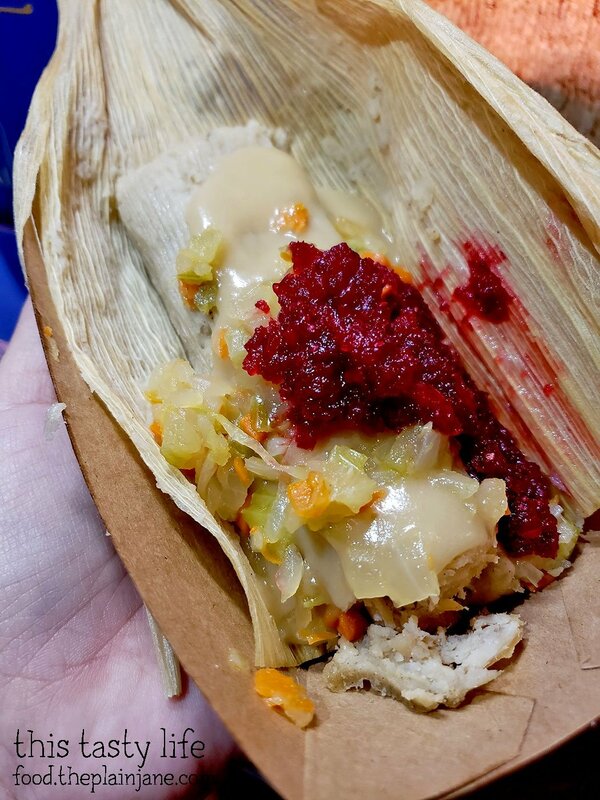 It’s like a Thanksgiving stuffed tamale with some cranberry relish on top. The masa was very tender and the turkey with stuffing was a lovely compliment to the whole dish. The cranberry relish added a little touch of sweetness that balanced out the flavors. 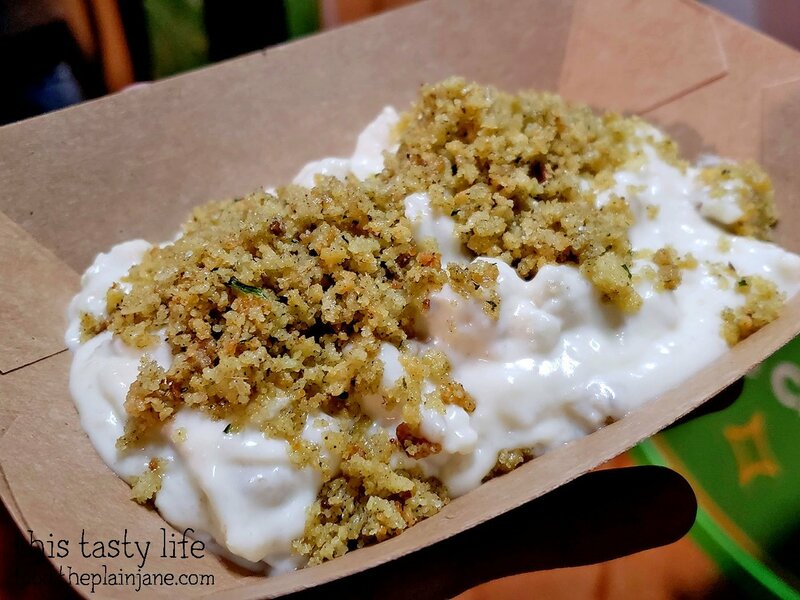 This was a really creative twist and we both really loved this dish – one of our favorites! Our next stop on the Festival of Holidays food adventure was at the Favorite Things booth for the Holiday Ham Shanks [$8 a la carte]. The ham shanks are in a brown sugar pineapple glaze! The glaze was also sort of a sauce? Or maybe that was separate? I couldn’t tell, really, but the ham shanks tasted better once you dipped it into the extra sauce. There’s a little bone in these pork nuggets and I felt that they could have been a little more tender but the glaze/sauce stuff was delicious. From the Blissfully Braised booth we shared the Pork Belly Adodo with Garlic Fried Rice [$7.75 a la carte]. 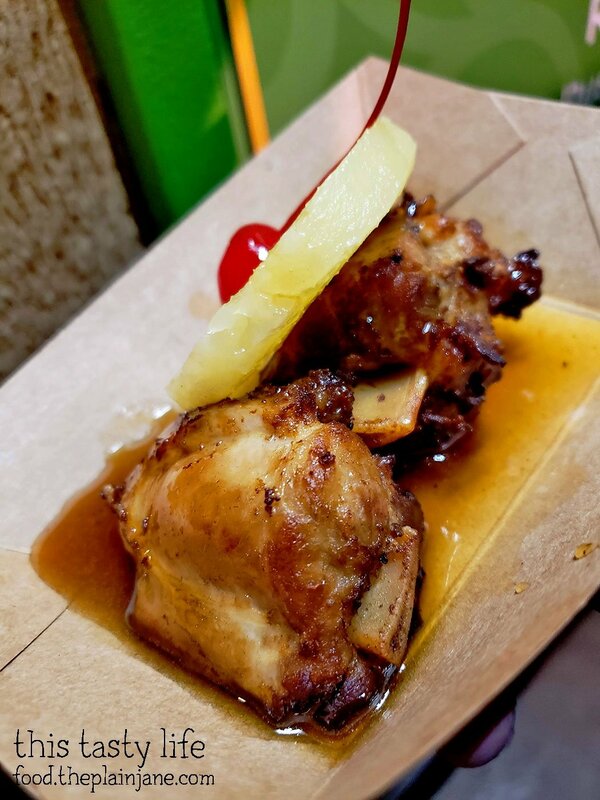 They had this dish last year and it was one of our favorites. The pork belly was super tender and had a really good flavor on it. The rice had weird crunchy bits this time so I didn’t like that quite as much and I let Jake finish off the rice. We felt it was better last year but still a good dish to get. 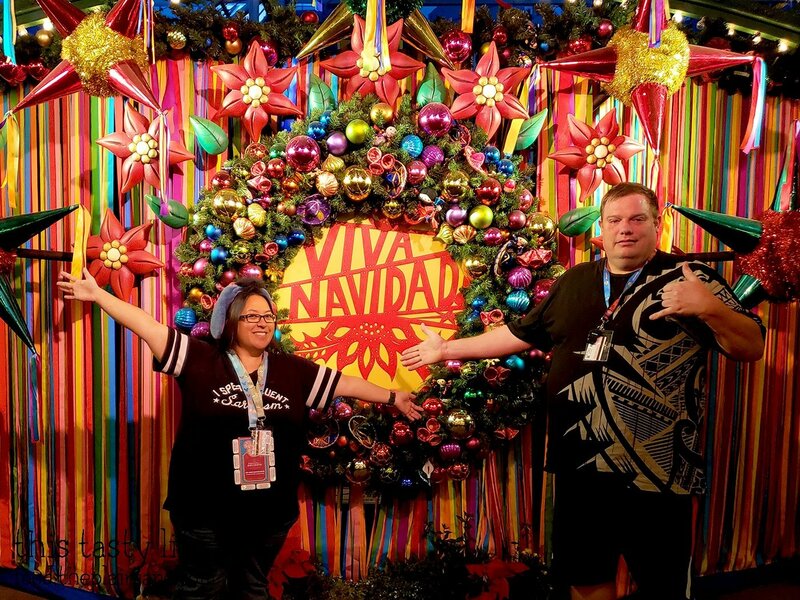 The last savory item we tried for the Festival of Holidays (which was also the last booth we visited) was hiding from us. It was at the Winter Sliderland booth which is hidden! Or rather, you have to go towards the Grizzly Peak area to get it. The rest of the booths are all on the “main drag” through California Adventure towards Pixar Pier. I had to look at a map to find this booth but luckily we did since this was THE BEST DISH of the night! It’s a Holiday Stuffing Mac & Cheese [$7.75 a la carte]. There’s super duper extra creamy mac & cheese on the bottom with stuffing “crumbles” on top. HOLY COW. The flavor of this one was a knockout – it tasted like stuffing right in with the mac & cheese. The stuffing had that wonderful mix of herbs and flavors (think poultry seasoning) and was crumbled up finely on top of the mac and cheese. Jake and I couldn’t believe how yummy this dish tasted and I told him I would try and recreate it at home. His reply? “You better.” haha! They tasted like buttery shortbread cookies with just the right amount of frosting on top. Crunchy and quite tasty! I enjoyed these cookies! I also picked up the Horchata Fudge [$4.75 a la carte] which was helpfully already in a package from the Visions of Sugar Plums booth. You can pair any of the desserts from Visions of Sugar Plums with milk to bring the total to $7 for a better value. That’s what we did and Jake drank the milk. I tried this this morning by cutting off a little piece and holy cow, it does taste a lot like Horchata! It has that cinnamony flavor to it but it also has the creamy, milky texture/consistency that you associate with horchata. Excellent flavor, really smooth, not overbearing sweet (as long as you just take a little). Quite tasty! Last but not least…. 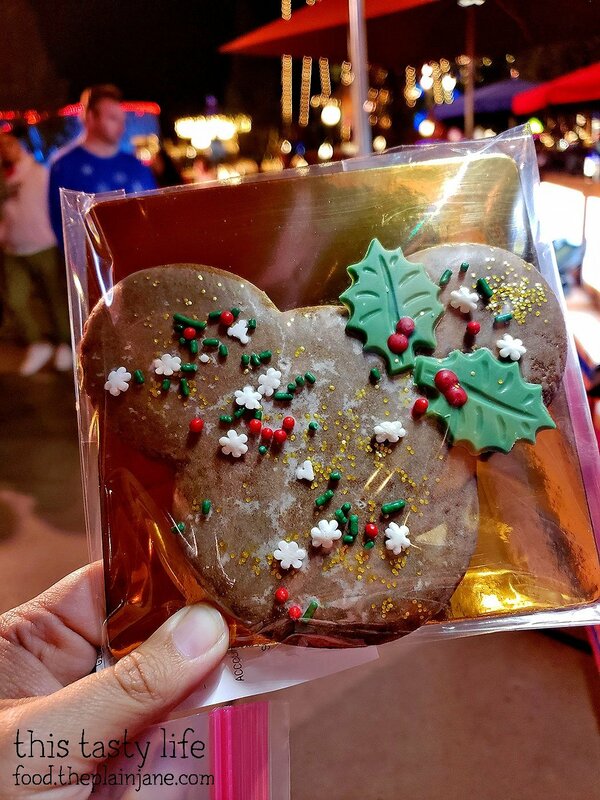 the Gingerbread Mickey [$5.25 a la carte] from Grandma’s Recipes. Cute decorations and also wrapped to go! This is a firm, soft gingerbread cookie and you get a bite of the ginger and spice while you eat it. There’s a really light glaze all over the cookie and overall it has a good flavor. Not super spicy and there’s a nice texture to it. Not too soft, not too firm, just right. I think I still prefer the thin, soft Gingerbread Men that they have in the park, but I ran out of time to look for those. 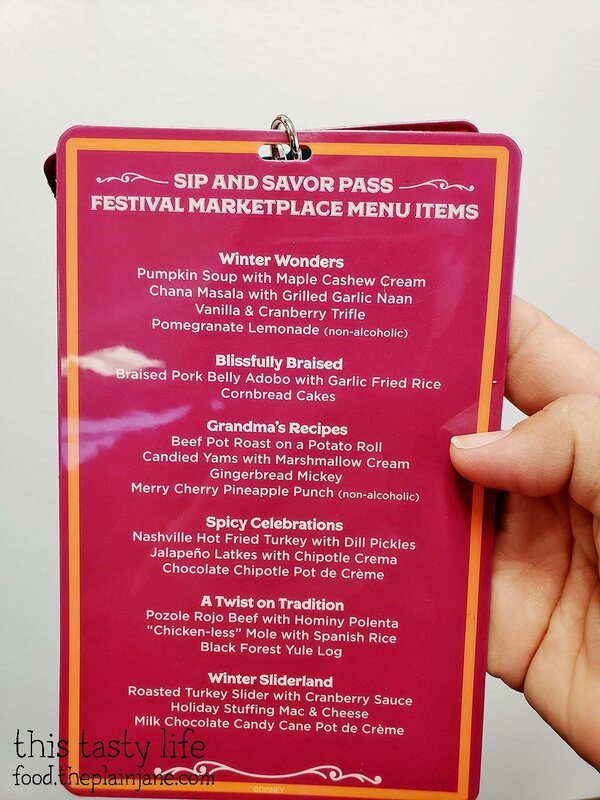 If we had paid for each item individually, it would have cost us $58, so getting the Sip & Savor Pass for $49 saved us $9. Not bad! 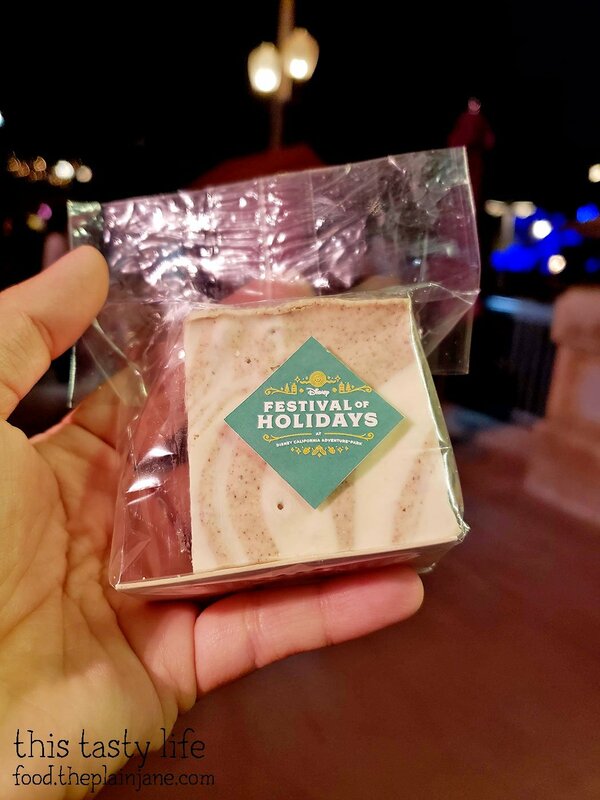 Get a look at the full Festival of Holidays of items featured (plus some photos) over on the Disney Parks blog here. Here’s a few other photos and sights from around the parks. 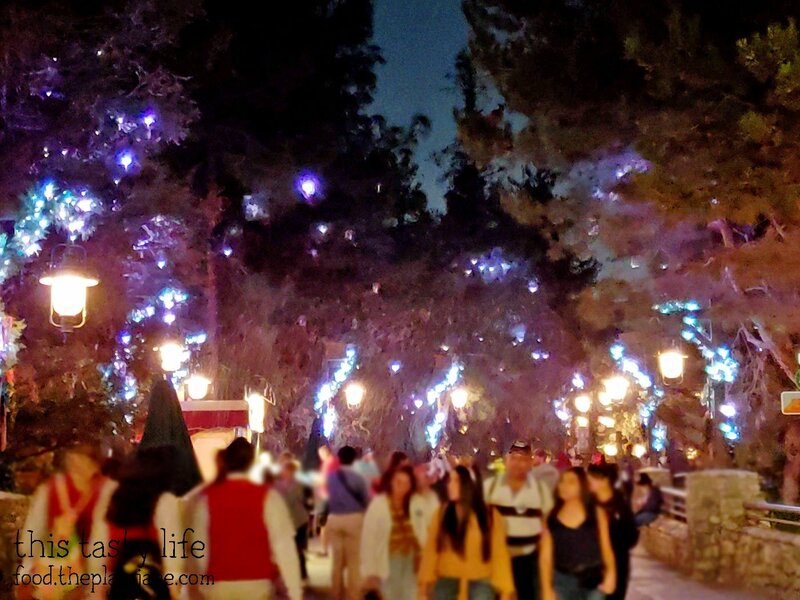 After dark, every 15 minutes it snows on the Grizzy Peak trail in Disney California Adventure. HOW COOL! This is the best photo I could get. I was standing in line for mac & cheese. Ha. The Christmas Tree lit up on Main Street in Disneyland. 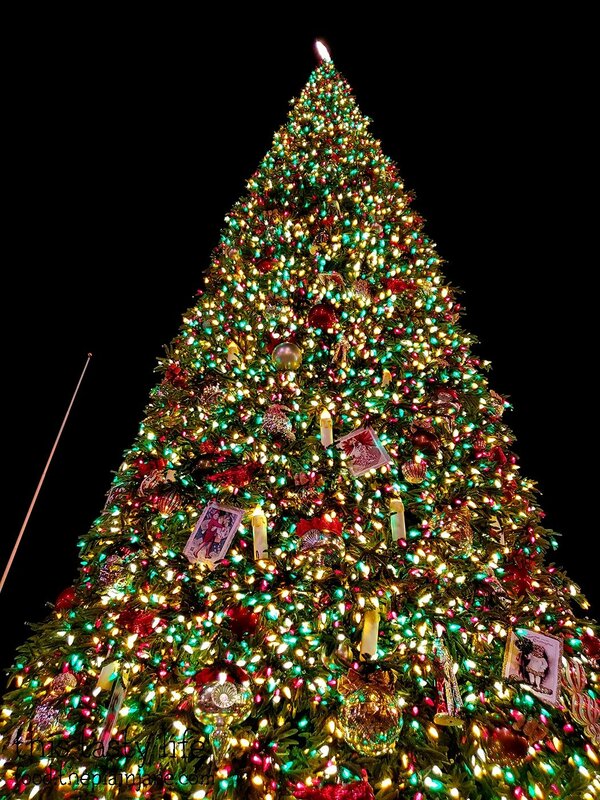 Close up of the tree in Disneyland. 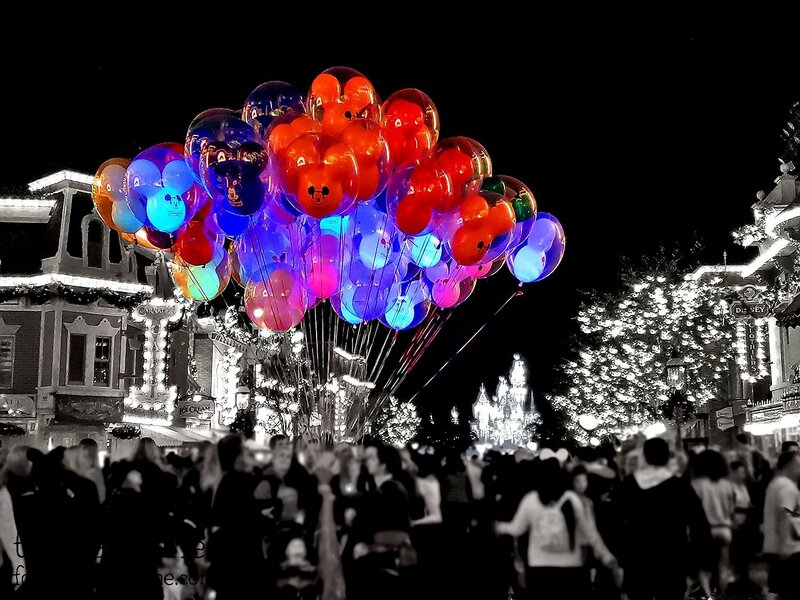 Having a little fun in Photoshop with a photo I took on Main Street in Disneyland. 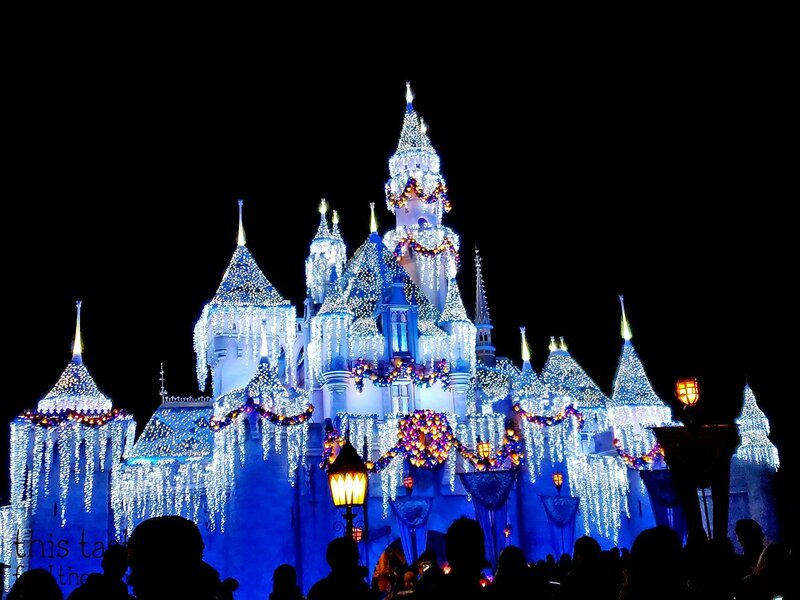 And finally… Sleeping Beauty’s Castle all light up for the holidays. Really cool b/w photos with the balloons/castle in color! Nice! 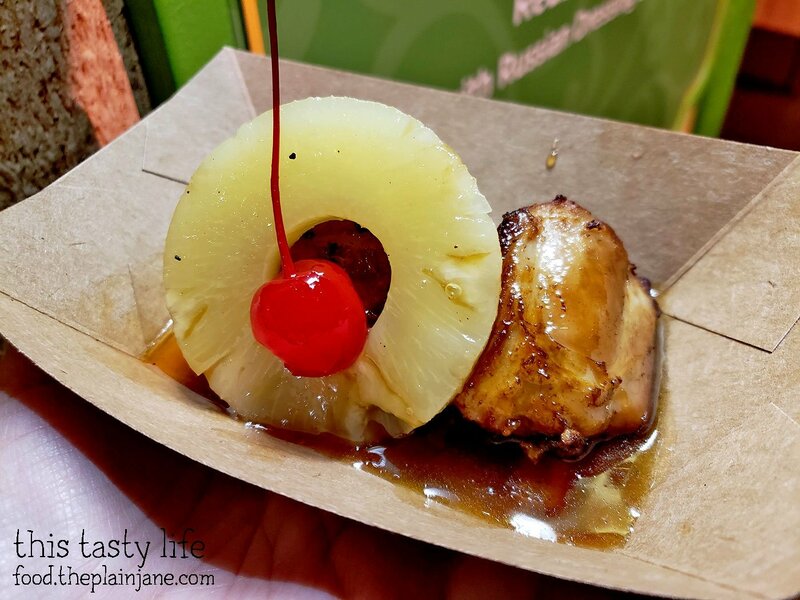 Pork belly adobo…I like it’s a choice there! Thanks, CC! I had fun playing in photoshop with those photos. 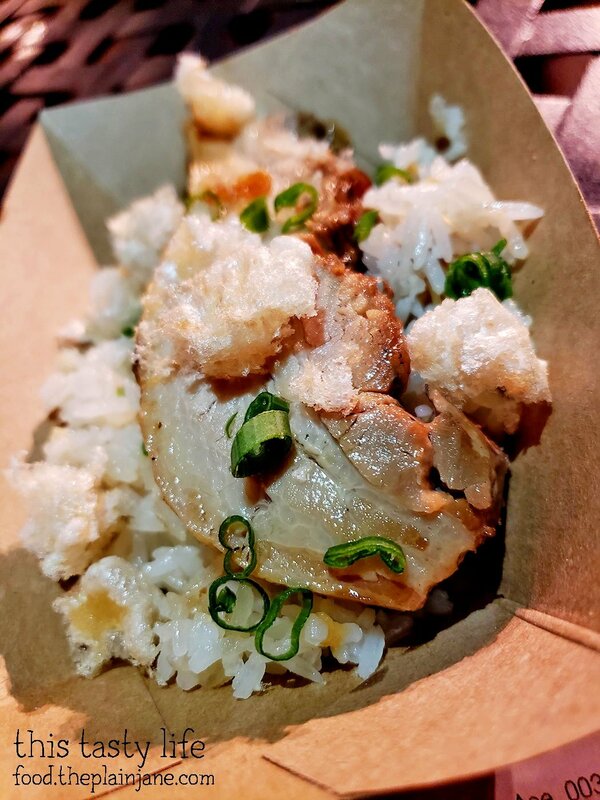 The pork belly adobo was also in the festival last year and I was excited for it then, too. The pork belly is so tender!